High-energy physics experiments tend to generate huge amounts of data. While this data is passed through analysis software, very often the first thing you may want to do is to graph it and see what it actually looks like. To this end, a powerful graphing and plotting program is an absolute must. One available package is called Extrema (http://exsitewebware.com/extrema/index.html). Extrema evolved from an earlier software package named Physica. Physica was developed at the TRIUMF high-energy centre in British Columbia, Canada. It has both a complete graphical interface for interactive use in data analysis and a command language that allows you to process larger data sets or repetitive tasks in a batch fashion. Installing Extrema typically is simply a matter of using your distribution's package manager. If you want the source, it is available at the SourceForge site (http://sourceforge.net/projects/extrema). At SourceForge, there also is a Windows version, in case you are stuck using such an operating system. Once it is installed on your Linux box, launching it is as simple as typing in extrema and pressing Enter. At start up, you should see two windows: a visualization window and an analysis window (Figure 1). One of the most important buttons is the help button. In the analysis window, you can bring it up by clicking on the question mark (Figure 2). In the help window, you can get more detailed information on all the functions and operators available in Extrema. Figure 1. On startup, you are presented with a blank visualization window and an analysis window. Figure 2. The help window gives you information on all of the available functions, operators and commands. Extrema provides 3-D contour and density plots. For 2-D graphing, you can control almost all the features, like axes, plot points, colors, fonts and legends. You also can do some data analysis from within Extrema. 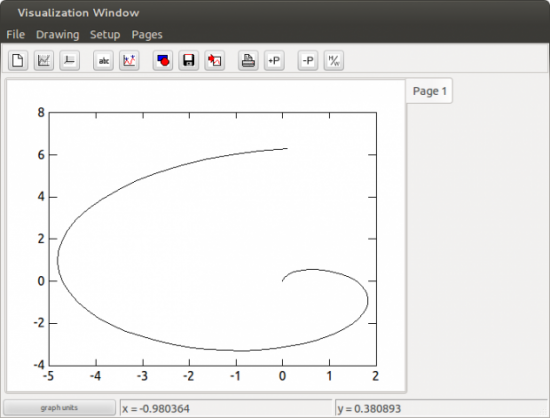 You can do various types of interpolation, such as linear, Lagrange or Fritsch-Carlson. You can fit an equation to your data with up to 25 parameters. 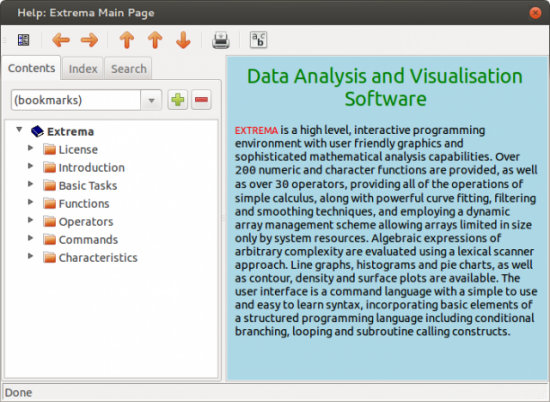 Extrema contains a full scripting language that includes nested loops, branches and conditional statements. You either can write out scripts in a text editor or use the automatic script-writing mode that translates your point-and-click actions to the equivalent script commands. The first thing you will need to do is get your data into Extrema. Data is stored in variables and is referenced by the variable's name. The first character of a variable name must be alphabetic and cannot be any longer than 32 characters. Other than these restrictions, variable names can contain any alphabetic or numeric characters, underscores or dollar signs. Unlike most things in Linux, variable names are case-insensitive. And remember, function names are reserved, so you can't use them as variable names. String variables can contain either a single string of text or an array of text strings. Numeric variables can contain a single number, a vector (1-D array), a matrix (2-D array) or a tensor (3-D array). All numbers are stored as double-precision real values. Unlike most other programming languages, these arrays are indexed starting at 1, rather than 0. There are no limits to the size of these arrays, other than the amount of memory available on your machine. Indexing arrays in Extrema can be interesting. If you want the eighth element of array x, you simply can reference it with x. You can grab elements 8, 9 and 10 with x[8:10]. These indices can be replaced with expressions, so you could get the eighth element with x[2^3]. There also are special characters that you can use in indexing arrays. The statement x[*] refers to all the values in the vector. If you want the last element, you can use x[#]. The second-to-last element can be referenced with x[#-1]. There also is a full complement of logical Boolean operators that give true (1) or false (0) results. This plots a fairly uninteresting straight line (Figure 3). Then you can go ahead and graph your data. 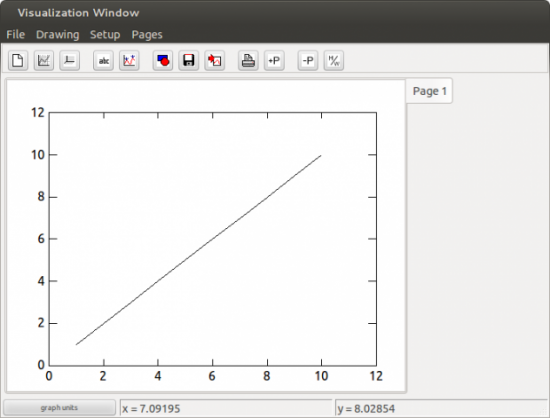 This will give you the plot shown in Figure 4.
to get a nice plot. Many options are available for the graph command (Figure 5). Figure 5. 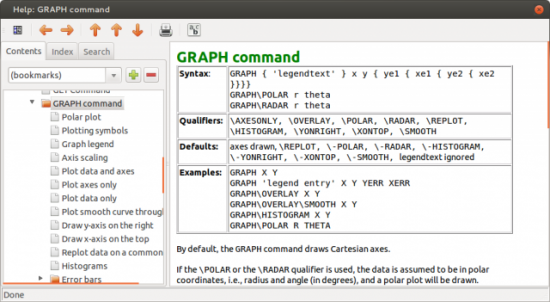 The graph command has many available options. where m is the matrix of values to be graphed. In this case, Extrema will make a selection of nice contour lines that create a reasonable graph. You can draw a density plot of the same data with the density command, where the values in your matrix are assigned a color from a color map, and that is what gets graphed. Unless you say differently, Extrema will try to select a color map that fits your data the best. A surface plot tries to draw a surface in the proper perspective to show what surface is defined by the z values in your data. Now that you have seen the basics of what Extrema can do, hopefully you will be inspired to explore it further. It should be able to meet most of your data-analysis needs, and you can have fun using the same tool that is being used by leading particle physicists.